Made from durable cotton canvas fabric with Laurel Burch original zipper pull. Exterior dimensions: 12 x 8.5" x 3.5". Interior dimensions: 12 " x 6" x 3.5. Due to the cutout on top, interior is smaller than exterior. 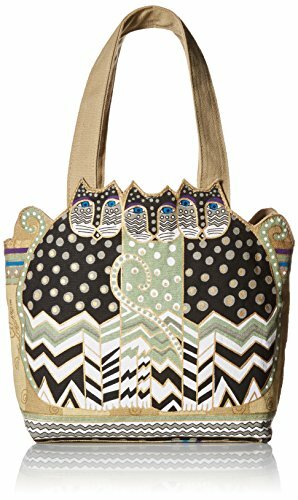 Laurel Burch popular feline design mini tote purse. Great as an everyday purse. Double carrying handles. Handle drop: approx. 8". Light weight. Easy to carry. Fully lined interior has a zip wall pocket for your essentials. Great gift idea for your friends and family. Made from durable cotton canvas fabric with Laurel Burch original zipper pull. Exterior dimensions: 12 x 8.5" x 3.5". Interior dimensions: 12 " x 6" x 3.5. Due to the cutout on top, interior is smaller than exterior. Laurel Burch popular feline design mini tote purse. Great as an everyday purse. Double carrying handles. Handle drop: approx. 8". Light weight. Easy to carry. Fully lined interior has a zip wall pocket for your essentials. Great gift idea for your friends and family. If you have any questions about this product by Laurel Burch, contact us by completing and submitting the form below. If you are looking for a specif part number, please include it with your message.